A penetrating look into the relationship between science and society and its affect on women in the late 19th century highlights The Literature of Prescription: Charlotte Perkins Gilman and The Yellow Wall-Paper, a new traveling exhibit from the NLM. In the late 19th century, when women began challenging traditional gender roles excluding or marginalizing them from political and intellectual life, medical and scientific experts drew on notions of female weakness to justify the continuing inequality between the sexes. 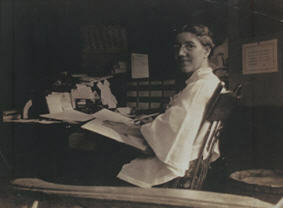 Discouraged from pursuing a career because of supposedly frail health, artist and writer Charlotte Perkins Gilman, counterattacked in her short story, The Yellow Wall-Paper, published in the January 1892 issue of The New England Magazine. It is now regarded as an important early work of American feminist literature. Consisting of a series of journal entries by a woman confined to her bedroom by her physician husband because of a “nervous condition,” it indicts the medical profession and social conventions then restricting women’s professional and creative opportunities. The Literature of Prescription ran through September 26 at the NLM. It is now a six-banner traveling exhibit accompanied by an online exhibition of additional primary source texts, educational resources for high school and undergraduate students, and expanded references. Using the exhibition as a resource, scholars can develop six hours of class materials including supplemental readings with discussion points. Visit the Traveling Exhibitions Web site for the tour schedule, or to apply to be a host institution.